The Loopy Lopp: Buyer Beware! I've spent quite a bit of time in the Commodities Exchange, I'm trying to build up my little gold stash during idle moments when I can't actually play, but do have time at the computer. There are a lot of quality of life improvements that both the Auction and Mailbox systems could use, but hopefully we'll get addons to sort them out. One thing that an Addon cannot fix is when the system tells you that items cost one thing, but a different amount is siphoned from your wallet. Oops! So let this be a heads up. If you see a really good deal, just buy one first. Make sure that it doesn't take 8 times as much as you expect. 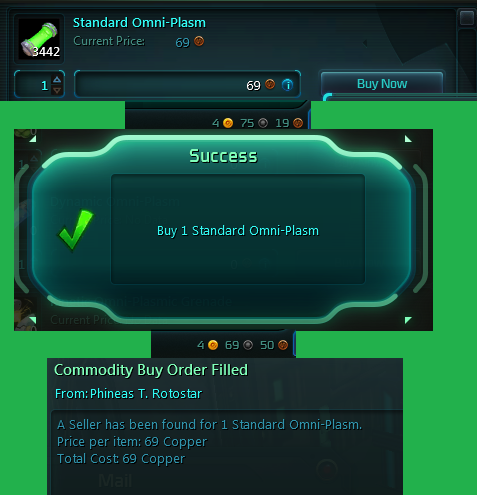 Here you can see the 69 copper Omni-Plasm that cost me (and Rades) 5 silver 69 copper.